Pervez Musharraf is history, but his opponents seem unable to agree on what to do next. After so many disappointments, can Pakistan rise to the occasion? 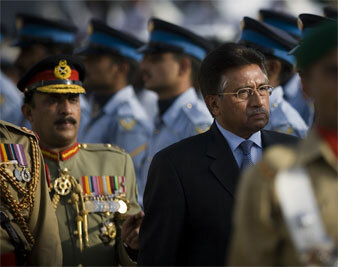 AP Images Pervez Musharraf, escorted by military guards, after announcing his resignation as president of Pakistan. Editor’s Note: This article was updated August 20. Barely twenty-four hours after President Pervez Musharraf exited the Pakistani scene, politically speaking, his opponents seem unable to agree on what to do next. It is not certain what General Musharraf will do now, part from undertaking a religious pilgrimage to Saudi Arabia. He was reported to be building a retirement home near the military center of Rawalpindi, and it will be a sign of Pakistani politcal maturity if he is allowed to stay in the country. More likely, Pakistani insiders have been telling the local media, he will live abroad, possibly in London or–for unexplained reasons–in the American state of New Mexico. Pakistanis should enjoy considerable advantages at this juncture: an elected Parliament, two strong political parties, a legal and judiciary system that proved its democratic credentials on the streets and vibrant media strengthened, ironically, during the Musharraf years. On Tuesday, however, deadlock set in as Musharraf’s opponents met to chart a course of action. The first imperative is the choice of a new president, which must be completed within thirty days. But the two coalition leaders forced together by circumstances–Nawaz Sharif, leading a branch of the Pakistan Muslim League (PML-N), and Asif Ali Zardari, head of the Pakistan Peoples Party of his late wife, Benazir Bhutto–do not yet appear to have an agreed candidate for president. Although Zardari says publicly he does not personally want the job but that it should go to his party, and to the province of Sindh–and public opinion does not view him favorably–he may be picking up support from the Muttahida Qaumi Movement, an opposition party based in Karachi, according to news reports. But Sharif, the leader of the second-largest party in the governing coalition, remains unwilling to back Zardari or his party for the presidency, and is also holding out for the immediate reinstatement of the justices dismissed by General Musharraf, including Iftikhar Muhammad Chaudhry, the chief justice of the country’s highest court. Zardari is bucking this, since he apparently fears Chaudhry could reopen corruption cases against him. The case of the justices now seems to be the major stumbling block to all further progress, and the country is getting nervous. The deadlock caused the Karachi stock market to fall three percent on Wednesday. While these domestic disputes occupy the attention of the two parties, which have been bitter enemies for more than a decade, the situation on Pakistan’s borders is deteriorating daily. It is no doubt coincidental that one of the worst pitched battles in recent fighting in Afghanistan took place Tuesday not far from Kabul, killing as many as ten French NATO troops, and that on the other flank, in Kashmir, Indian news agencies are reporting that possibly several hundred thousand people have been involved in demonstrations demanding separation from India in the Muslim-majority Kashmir Valley, where nearly 7 million of the 10 million people in the Indian-administered territory live. Some Indian politicians will be tempted to pin this flareup on Pakistani provocateurs. On the Afghan side, Pakistan’s army chief, General Ashfaq Kayani, was in Kabul today on a prearranged visit to meet with American military officers, but Topic A–Pakistan’s lack of control over Taliban and Al Qaeda militants based in its lawless frontier region–had to be on the agenda. General Kayani was not planning to meet the president of Afghanistan, Hamid Karzai, a strident critic of Musharraf’s policies. But he is well aware of Afghanistan’s anger, especially after allegations that the Pakistani intelligence services may have had a hand in the recent bombing of the Indian embassy in the Afghan capital. The government of Pakistan, all but paralyzed over the drive to oust Musharraf, now has limited time to prove it can frame and adopt a policy on the activities of militants that will be more effective than his. Otherwise, given a dangerous vacuum, the United States could increase its activity in the border region, pursuing militants or bombing their hideouts, with the attendant political fallout in Islamabad. And violence within Pakistan, where Shia and Sunni discord runs deep, will grow. Closer to home for the political coalition now governing Pakistan, the battered stock market will have to regain confidence, as will business leaders and foreign investors. Nawaz Sharif comes from a rich Punjabi business family and is perhaps more aware of this than Zardari. But both are known for turning both government power and private enterprise into corruption-ridden tools for their own benefit. When the last military ruler, General Mohammed Zia ul Haq, was killed in a mysterious air crash in 1988, which also killed the American ambassador, Arnold Raphel, Pakistan was under military rule, and what political institutions there were existed only on paper. To everyone’s surprise, a political process began soon, the military stepped back, a reasonably orderly election was held within a few months and a woman, Benazir Bhutto, was sworn in as prime minister by a hand-picked president thought to be sympathetic to religious conservatives. Pakistan’s current uneasy leadership will be expected to do more to put the country back on track domestically after more than a year of turmoil. Media commentators in both India and Pakistan are adopting a “wait and see” attitude at best, clearly concerned that Pakistani politics could implode of their own volition.